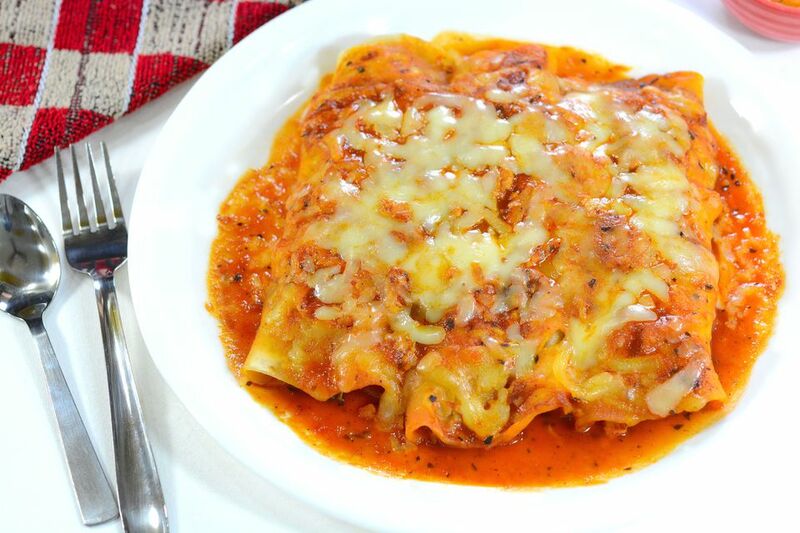 Enchiladas and the practice of rolling tortillas date back to Mayan times in Mexico. People in the Valley of Mexico first ate corn tortillas filled with fish. Today, combinations include beans, cheese, meat, potatoes, and vegetables. This vegetarian enchilada recipe with tofu and cheese is very basic, but is a great recipe to try if you want to pop some enchiladas in the oven in less than ten minutes. You can always toss in a can of black olives, or throw in some leftover precooked veggies as well. In a large pan, crumble the tofu and sautee in olive oil with taco seasoning or chili powder until lightly golden brown and coated with spices. Transfer the sauteed tofu to a large bowl and add approximately 1/2 cup enchilada sauce and half of the cheese. Combine well. In the bottom of a baking pan or casserole dish, spread a thin layer, about 1/4 cup, of enchilada sauce. Place a few spoonfuls of the tofu mixture in each flour tortilla. Roll up and place in baking dish, stacking each enchilada closely. Pour the remaining enchilada sauce over the tortillas in the pan and sprinkle the rest of the cheese on top. Bake your tofu enchiladas for 20 to 25 minutes, or until done.